Neon has been a trendy color to wear in the most recent years; and if you're like me who loves taking risks and LOVES to stick out from the crowd, I would say neon is the way to go! I love to wear bright, BOLD colors especially in the summer time. 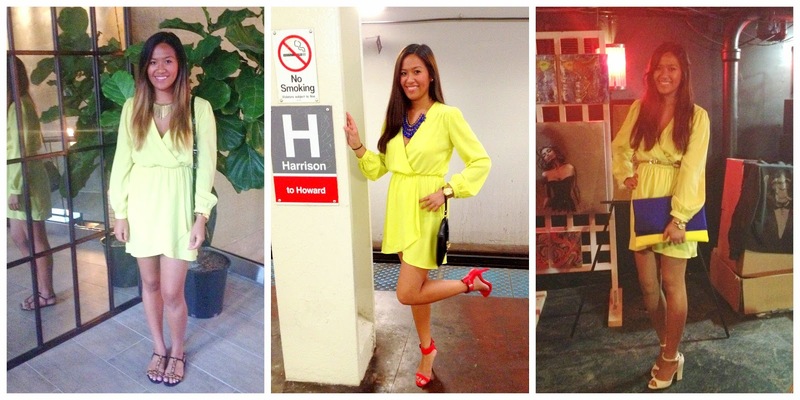 I am 100% Filipino, so the neon colors complement nicely on my dark brown summer tan! Last night I attended my second Chicago Blogger Network Happy Hours event at the River Roast downtown! This place just opened last month, with a beautiful view of the Chicago river and top-notch food by Chef Tony Mantuano of Spiaggia and Bar Toma. As always, I had a lovely time, and had a chance to catch up with my fellow blogger friends as well as meeting new ones! When I looked up this restaurant, I saw that the atmosphere looked a bit more dressy but casual for the bar area. Plus the weather seemed to be a bit chilly last night, so based off of that I decided to wear a long sleeve wrap dress, that can easily be dressed up but casual at the same time. I absolutely adore this dress, it's one of my favorite dresses I have purchased and it happens to be neon! You might have seen me in this dress once or twice before // all of course in different ways! This dress is just super versatile, which is one of the many reasons I love about it! I bought this dress last year at @Lulus and it's a great color to brighten up your day... Oh and have every one who walks by stare at you because it's just that bright! =) So that being said, this is definitely a bold and stand out dress to wear! You can surprisingly still purchase this dress HERE (search neon wrap dress) // comes in Magenta and Teal as well! Previously I have always worn this look dressed up, but I wanted to keep it casual this time so I paired it with my new cheetah sandals I purchased from Zara not too long ago >> which by the WAY is definitely a "Fancista Finds"! These cuties I found for a great deal at $15! Zara has had their summer/spring sale for a while already, so not sure if they still have them in store, but you should definitely check! I also wore a gold spiky necklace and a black purse to finish up this look! Thanks to Jill from Chicago Blogger Network for hosting a fun social event! Well I have another fashionista event that I will be attending tomorrow! I have yet to decide on what I am going to wear! In the meantime.... Which look do you love more?!? Thank you! I actually did it myself =) And I love yellow, thank you for the kind words!